On April 7, the World Health Organization celebrates World Health Day. The day is an opportunity for the organization to highlight a specific area of concern, and this year the theme is “Universal health coverage”. As Canadians, we are fortunate to have access to health care through our government but that’s certainly not the case for everyone around the world. Muskoka Woods’ primary focus as an organization is not in the arena of healthcare, but we share in the general spirit of the WHO’s mission – we want good things for all people. There are many areas of the world where disaster has caused damage and in turn, peoples’ health has suffered. One of those places is New Orleans, and while we are not in the business of providing healthcare, we want to make sure that, in places where help is needed, we are able to contribute and to show we care. Every March, a group of Alumni from our CEO program have the opportunity to visit New Orleans and to work with various organizations and programs in the city that are striving to make a difference for people in need. There is much need specifically as a result of Hurricane Katrina, from which the city has not yet fully recovered. CEOs are amongst the oldest campers at Muskoka Woods and take part in a four-week leadership program that ends in a graduation ceremony. This marks the end of their time as guests at Muskoka Woods. During these four weeks, CEO guests see an increase in their communication skills, conflict resolution, community living and other life skills – all important qualities of strong leaders. CEO graduates understand that other people care about them, because here at Muskoka Woods we invest time and care into our relationships with each individual CEO guest. We tell them that they are leaders, because we know that they are! To achieve their potential as leaders, each CEO guest simply needs to tap into their individual strengths and passions in order to grow and let their leadership qualities blossom. As we speak truth about their strengths, we see them grow in confidence and leadership. This confidence follows them in life, and we want to ensure that we help to nurture and grow their confidence and leadership skills for the year after their CEO graduation; this confidence can help prepare them for success in life, and we want to make sure that we continue to feed it! So, after the graduation ceremony, we stay in touch with graduates and make sure that we connect with them on a monthly basis. Sometimes it’s a social event, like a trip to Canada’s Wonderland, and other times it’s a time to check in on their CEO project and ensure that we’re helping them to make the most of their four weeks in the CEO program. One of the post-grad opportunities for CEOs is a service trip to New Orleans in March, where they can put into practice their leadership qualities. 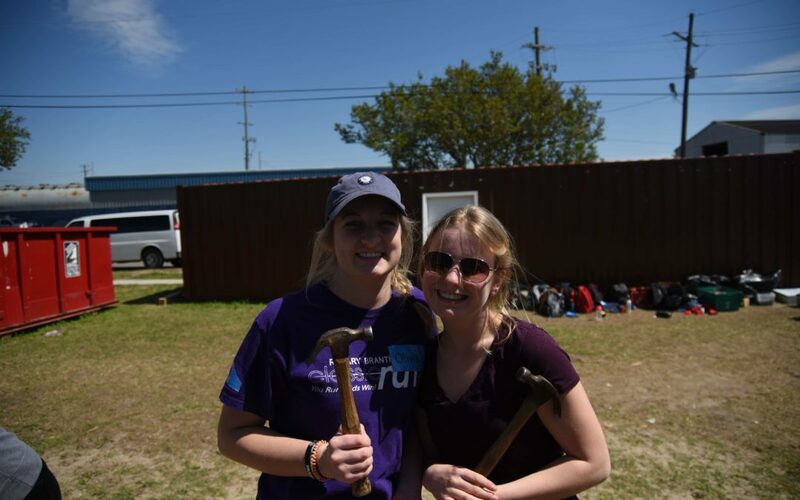 Along with our primary partners on the trip, Steve and Bronwen Niles of Youth With A Mission (YWAM) New Orleans, our youth have the opportunity to understand the impact that their acts of service can have on the lives of others. Over the course of an eight day trip, CEOs work to learn through service. The activities in which they participate include: working on a home with Habitat for Humanity, feeding the homeless, and visiting a youth detention center. These acts help to build a sense of responsibility and community-mindedness in CEOs and show them that their actions can have a major impact in communities near and far. This trip offers challenges, experience, and opportunities for CEOs to make an impact on their world – and to take those experiences home with them and bring that impact to their own communities. New Orleans Area Habitat for Humanity (NOAHH) is a non-profit organisation that works to empower families in New Orleans through housing. They have a program that involves volunteers working alongside families in need to build a house that the family can then own with an interest-free mortgage. This is a need in the community especially after many homes were destroyed during Hurricane Katrina. One day of the CEO trip is dedicated to contributing on the construction site, and helping to get that work done. While this may seem like it is a construction project, it’s not. While there is satisfaction in learning new skills and building something with your own hands, that’s not fully the goal of the Habitat for Humanity project in New Orleans. CEOs can learn from this day that the value of their service is not necessarily in the physical result of their work but rather in the social and emotional impact. This day is not just about building; it’s about helping to make a family at home again in the wake of a natural disaster that has taken over a decade to rebuild from. CEOs also take a tour of the lower-ninth ward, an area still in recovery, in order to fully understand the impact of Hurricane Katrina. Working with the New Orleans Mission homeless shelter (the largest provider of continuous emergency shelter services in Louisiana), CEOs have the opportunity to impact lives by serving lunch in the homeless shelter or engaging in conversation with homeless people in the streets. This moment of service is about much more than just being a vessel that transports food to people; this opportunity is about having conversations, making a connection, and having a powerful moment with other human beings. CEOs can impact the lives of others directly, by sharing their gifts and making a human connection, and that can be a powerful and empowering moment in a young person’s life – to understand that small acts of service and connection can make a great impact. Of course there are acute basic needs amongst the homeless community for food and shelter, but a lot of what’s missing for some is being treated with respect and human dignity. Our goal is that CEOs on this mission can come to understand that message through direct experience. A homeless person is a person, with whom they may have much in common. CEOs also have the chance to do some community outreach at an after-school program for kids. In a housing project community with a historically high crime rate (which has since become quite safe) CEOs build relationships with children who come from less privileged backgrounds, and in the process build family trust and involvement. This is a great opportunity for CEOs to develop their leadership qualities while working with people whose lives may be very different from their own. When working with younger children and sometimes their parents, they can build bridges that cross borders, cultures, life experience and socioeconomic class. On this service trip, CEOs spend a morning at a youth detention centre where they put on a church service for the resident youth. They also have the opportunity to converse with the youth and understand their stories, and come to know that these youth in many cases have a lot in common with our CEOs. They may be at different places in their lives, but they have hopes and dreams for the future, they have shared interests – and at the end of the day, they are all human beings. We want to make sure CEOs who take part in this program are able to learn from the leaders and people that they meet in New Orleans; to bring home lessons that help them to shape their world, and to carry social justice forward in their own communities. This experience often causes a big change in mindset, perspective, and an understanding of how youth can contribute where they live. Days like World Health Day are a great opportunity to bring awareness to widespread humanitarian crises, and we believe that our CEOs and youth can help to make a difference in the future of the world as leaders in the health (spiritual or physical) of humanity. All we have to do is ensure that we help shed light on issues that could benefit from the leadership and service of our youth. Muskoka Woods is a summer camp so excellent, you’ll want to come.